Cine Europa goes into full swing with the annual festival and its educational component, Pinoy-Euro Connection 2016, happening on September 10 and 17, 1 p.m., at the Shang Cineplex in Shangri-La Plaza. 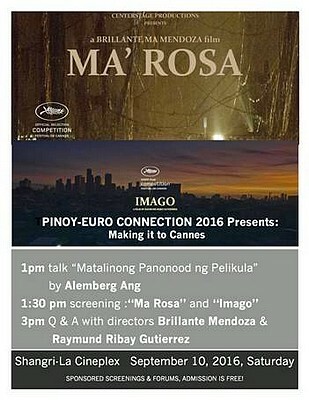 First up this coming Saturday is a talk about "How To Watch Films Intelligently" by independent film producer Alemberg Ang, followed by screenings of the full-length feature Ma Rosa and the short film Imago, two Filipino movies that were shown at the most recent Cannes International Film Festival. A Q&A with directors Brillante Mendoza and Raymund Ribay Gutierrez caps the day. Admission is free.